Figure 1. Treatment of NIH/3T3 cells with PDGF induces phosphorylation of Akt1 at Thr308 and Ser473, S6 Ribosomal Protein at Ser235/236 and p44/42 MAPK at Thr202/Tyr204 as detected by the PathScan® Cell Growth Multi-Target Sandwich ELISA Kit #7239. 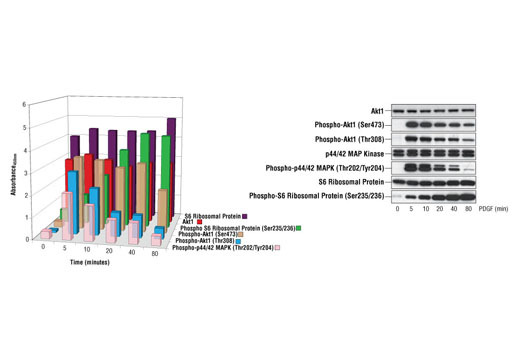 While dynamic phosphorylation is observed throughout the time course, the level of total p44/42 MAPK, Akt1 and S6 ribosomal protein remains unchanged as demonstrated by sandwich ELISA and Western analysis. NIH/3T3 cells (80-90% confluent) were starved overnight and stimulated with PDGF (100 ng/mL) for 5, 10, 20, 40 and 80 minutes at 37ºC. Lysates were assayed at a protein concentration of 0.45 mg/mL. The absorbance readings at 450 nm are shown as a 3-dimensional representation in the left figure, while the corresponding Western blots are shown in the right figure. The antibodies used for the Western analyses include S6 Ribosomal Protein Rabbit mAb #2217, Phospho-S6 Ribosomal Protein (Ser235/236) Antibody #2211, Akt Antibody #9272, Phospho-Akt (Ser473) (193H12) Rabbit mAb #4058, Phospho-Akt (Thr308) Antibody #9275, Phospho-p44/42 MAPK (Thr202/Tyr204) (E10) Mouse mAb #9106, p44/42 MAP Kinase Antibody #9102. Figure 2. 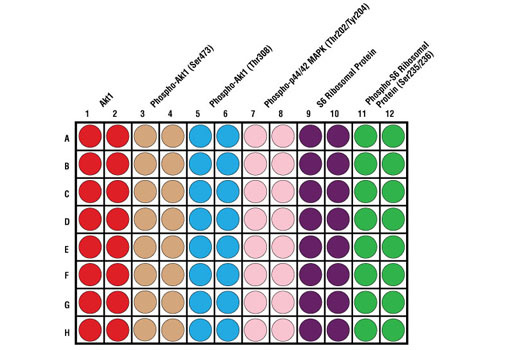 Schematic representation of a 96-well plate depicting the color-code of the reagents used to detect endogenous levels of Akt1 (red; 1 & 2), phospho-Akt1 (Ser473) (tan; 3 & 4), phospho-Akt1 (Thr308) (blue; 5 & 6), phospho-p44/42 MAPK (Thr202/Tyr204) (light pink; 7 & 8), S6 ribosomal protein (purple; 9 & 10) and phospho-S6 ribosomal protein (Ser235/236) (green; 11 & 12). CST's PathScan® Cell Growth Multi-Target Sandwich ELISA Kit #7239 detects endogenous levels of six proteins: S6 ribosomal protein, phospho-S6 ribosomal protein (Ser235/236), Akt1, phospho-Akt (Ser473), phosho-Akt (Thr308) and phospho-p44/42 MAPK (Thr202/Tyr204). Activation of these proteins can be observed over time in response to PDGF. As shown in Figure 1, stimulation of serum-starved NIH/3T3 cells with PDGF promotes phosphorylation of Akt1 at Thr308 and Ser473, S6 ribosomal protein at Ser235/236 and p44/42 MAPK at Thr202/Tyr204. The level of each target protein (phospho and nonphospho) remains unchanged throughout the 80 minute time course as demonstrated by Western analysis. Akt is a protooncogene with a critical regulatory role in diverse cellular processes including growth, survival and the cell cycle. Akt is also a major regulator of insulin signaling and glucose metabolism (1-4). Akt is activated by PI3 kinase signaling and activation loop phosphorylation at Thr308 by PDK1 and by phosphorylation within the carboxy terminus at Ser473 by the mTOR-rictor complex (TORC1) (5-7). Both p44 and p42 MAP kinases (Erk1 and Erk2) function in a protein kinase cascade that plays a critical role in the regulation of cell growth and differentiation (8-13). MAP kinases are activated by a wide variety of extracellular signals including growth and neurotrophic factors, cytokines, hormones and neurotransmitters. Activation of MAP kinases occurs through phosphorylation of threonine and tyrosine (202 and 204 of human MAP kinase or 183 and 185 of rat MAP kinase) at the sequence T*EY* by a single upstream MAP kinase kinase (MEK) (14,15). To effectively promote growth and cell division in a sustained manner, growth factors and mitogens must upregulate translation (16,17). Growth factors and mitogens induce the activation of p70 S6 kinase, which in turn phosphorylates the S6 ribosomal protein. Phosphorylation of S6 ribosomal protein correlates with an increase in translation, particularly of mRNAs with an oligopyrimidine tract in their 5' untranslated regions (17). This group of mRNAs (5'TOP) encodes proteins involved in cell cycle progression and proteins that are part of the translational machinery, such as ribosomal proteins and elongation factors (17,18). The main in vivo S6 ribosomal protein phosphorylation sites, including Ser235, Ser236, Ser240 and Ser244, are located within a small 19 amino acid region in the S6 carboxy terminus (19,20).